We are a custom fabric workroom established in 1974, serving the needs of the architectural and interior design communities. Visit our Gallery to see samples of our work. • Open Workroom, Open Communication You and your client are welcome in the Drapes Etc. 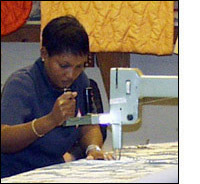 workroom at any time during the fabrication process. By keeping communication open, we assure that every product transcends your expectations. • Ease and Experience Drapes Etc. makes the fabrication process smooth and enjoyable, no matter the circumstances. We go the extra mile, bringing our years of experience to every job. • Vision If you've ever been told, "it can't be done," you'll appreciate our willingness to see beyond the challenges and find the solutions. • Quality and Service First Great finished products grow out of exceptional service. We are as attentive to the small particulars as you are. The details make the difference.